I hope you all had wonderful weekends! I was stuck on my couch with a nasty cold, but I did have time to edit some pics that I took last week after work. 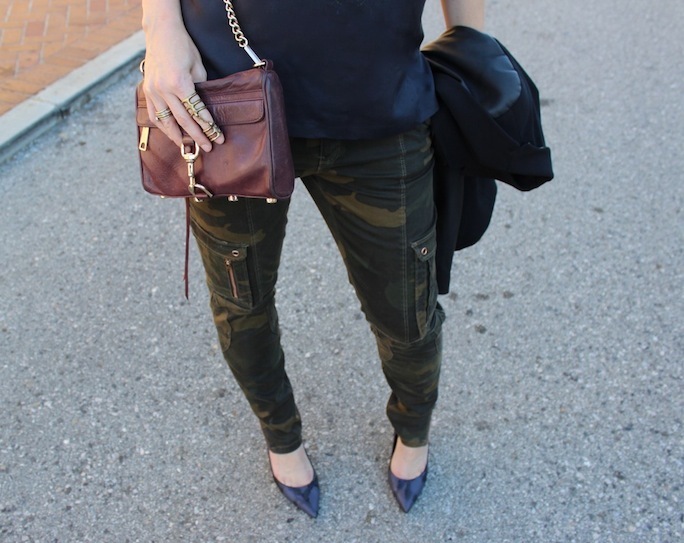 Camo print pants for the office may not be your traditional work wear, but I dressed them up with a faux leather-sleeve blazer, print silk tee and some pointed toe pumps. Those camo pants are fabulous! I LOVE this!! When did you start putting outfit pictures up with you in them?! I'm so excited! You look amazing, and I love that blazer like crazy. Love, love, love this look! AND I would love to add that bag to my shopping list. Great color! OMG you look so good in this outfit! Love the styling and that tee! What a great look, you look super cute and stylish!